The first Vega rocket climbed away from a tropical spaceport in South America on Monday, successfully injecting nine satellites into orbit and inaugurating a new capability in Europe's growing launcher family. "A new member of the launcher family has been born," said Jean-Jacques Dordain, director-general of the European Space Agency. "Today is the first day of a new operational life, which doubtless will be a long and successful one. 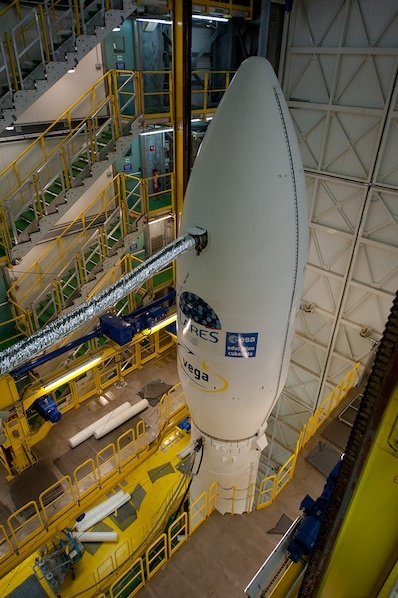 Vega is a launcher that's necessary for us at ESA. We've already reserved six launches." The 98-foot-tall booster is aimed at Europe's institutional market, and officials say it will offer government science satellites an affordable, indigenous option for getting into space. Vega joins the stalwart Ariane 5 launcher, one of the most powerful rockets in the world, and a "Europeanized" version of Russia's Soyuz launcher at the Guiana Space Center, a spaceport in French Guiana. "I was forbidden to buy any bottles of champagne before the launch, but we will drink everything in Guyane tonight," said Stefano Bianchi, ESA's Vega program manager, hailing a "perfect" mission which, at first glance, seemed to qualify the launcher to haul Europe's more costly satellites into orbit. The Vega rocket lifted off at 1000 GMT (5 a.m. EST) from the Guiana Space Center, a South American facility that sits where the Amazon jungle meets the Atlantic Ocean. Vega's launch pad is the former home of the Ariane 1, Ariane 2 and Ariane 3 rockets, which flew from the facility from 1979 until 1989. Blastoff occurred just after sunrise in French Guiana, and the launcher rapidly streaked into a mostly cloudy sky trailing an orange flame and plume of exhaust smoke. 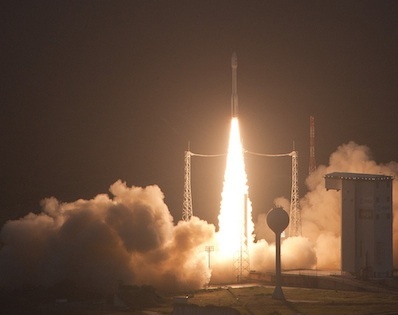 Vega's three solid-fueled motors fired in quick succession, then a Ukrainian upper stage engine ignited twice to reach a 900-mile-high orbit to release the rocket's primary payload, an Italian physics research satellite named LARES. Learn more about Vega's payloads. Another upper stage engine firing lowered the orbit before deploying eight more satellites: an Italian university demo craft named ALMASat 1 and seven CubeSats from other European learning institutions. "Everything was really nominal as far as the data we had in real-time," Bianchi said in a post-launch interview from Kourou, French Guiana. "The orbit was perfect." Monday's successful launch capped an 11-year, $1 billion development program led by Italy, which funded the majority of Vega's design, testing and implementation. "We will have further data exploitation in the coming days, but so far the data that have are perfect, just perfect," Bianchi said. Monday's qualification launch cost 40 million euros, or $53 million. Five more ESA missions are scheduled beginning in early 2013, when the next launch of Vega will hoist the Proba-V remote sensing satellite and multiple smaller payloads. The third flight of Vega, set for late 2013, will loft ESA's ADM-Aeolus mission to measure global winds from orbit with a laser instrument. The next five missions, collectively known as the Vega Research, Technology and Accompaniment program, will help support and secure Vega's place in the commercial market. It's an initial investment of 400 million euros, or $530 million, to keep Vega flying through 2014. ESA managed Monday's mission, but Arianespace will oversee future Vega launch operations alongside the Soyuz and Ariane 5. 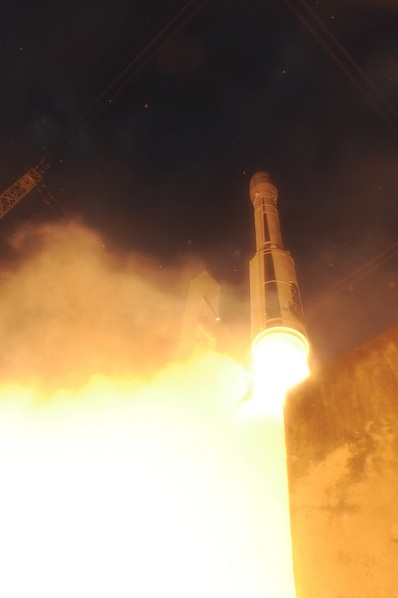 Arianespace signed Vega's first two commercial launch contracts in December to deliver to Sentinel Earth observation satellites to orbit between 2014 and 2016. "You've all placed your money on Vega, and you've won the bet," said Jean-Yves Le Gall, Arianespace chairman and CEO, in remarks to dignitaries in Kourou. "Well done." Vega's backlog now stands at seven firm missions. Europe backed the Vega program to obtain a homemade launcher for its small institutional payloads, particularly remote sensing satellites and space science research probes. The lead contractor for the Vega program is ELV SpA of Rome, a joint venture between the Italian space agency and Avio SpA, an Italian aerospace company. The genesis of Vega comes from Italian operations of the U.S. Scout launch vehicle from the San Marco platform, an ocean-based launch site that was positioned off the coast of Kenya for missions from the 1960s through the 1980s. After winning initial support of ESA member states in 1998, Italy funded 58 percent of Vega's development and spearheaded the development of new technologies for the launcher, including oversight of all four stages through Avio. The addition of fresh technology, including next-generation computers, control software and advanced solid-fueled motors, was another objective of Vega's development. Avio and Europropulsion, which is partially owned by Avio, led the design and testing of Vega's first stage motor, which generates up to 683,000 pounds of thrust for nearly two minutes. The motor, called the P80FW, is an evolution of the Ariane 5 rocket's solid rocket booster. But Vega's first stage replaces Ariane 5's hydraulic steering actuators with an electromechanical system provided by Sabca of Belgium. The P80 motor is the first rocket stage of its size to use electromechanical actuators, which are lighter and easier to operate, according to engineers. Another technological advancement tested by Vega is the use of carbon-epoxy filament-wound motor casings, which are cheaper to produce and more reliable than previous rocket motors, according to Avio. "About 1-out-of-2 qualification flights failed in the last 25 years," Bianchi said. "I was pretty anxious about that because the system is completely new. All the motors are new, so you can imagine with such statistics, you can't sleep very well. I am amazed we achieved all our objectives." Systems demonstrated on Vega could find their way into the heavy-lift Ariane 5 rocket in the next few years, and ESA says the continent's next-generation launcher, Ariane 5's replacement, will rely on advancements made in the Vega program.